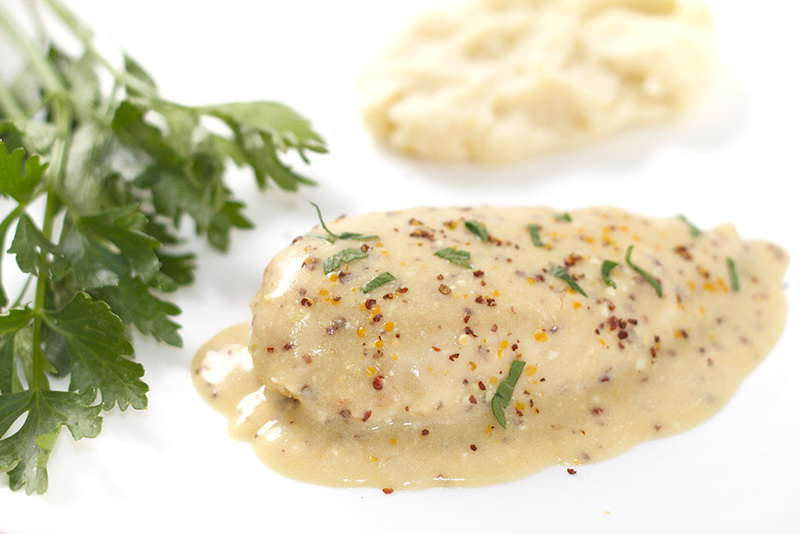 Velvet chicken breast in mustard sauce. I was very skeptical when I started to cook this. Mustard is a very pungent condiment, specially the kind we get in India. But the final result of chicken with mustard sauce mixed with cream, were very good. The dish still is bit pungent and is very “mustardy”, if you are not a fan of mustard, you may not like it. I also learnt another trick to pan fry chicken breasts to perfection – Velveting. Marinading in egg white and cornstarch and then frying it made the chicken golden (the processing is called velveting) and the cooking process was finished by adding the chicken in mustard sauce. You can cut chicken into long strips before adding it to the sauce. This is Chinese technique but you can mix it into continental cooking with great results. This is my version of Velvet Chicken breast in Mustard sauce and I teamed it up with creamy mashed potatoes. Clean the chicken breast and beat them up with a rolling pin so that they are about 1/2 inch thick. Season them with salt and pepper. Beat the egg whites till frothy and slowly add the cornstarch to it. Keep mixing so that there are no lumps. Marinade the chicken breasts in this mixture and keep for about 30 minutes. Mix Cream and Yoghurt together to make crème fraîche. Mix Dijon Mustard and mustad powder and keep aside. In a pan, add oil and saute the chicken breasts lightly (about 30 seconds each side). Remove the chicken breasts and drain the excess oil. This is called Velveting of the chicken breasts. Discard the remaining oil and wipe the pan. Return it to the stove and add the mustard mixture and the prepared crème fraîche. Also pour in the chicken broth while stirring the mixture continuously. After the sauce comes to a boil, add half the chopped celery and the velveted chickeb breasts to the sauce. Keep the flame low and allow the chicken to cook completely. After the chicken is cooked, transfer them to a plate and pour sauce over it. Garnish it with some chopped celery and serve with creamy mashed potatoes. Velveting is a technique in Chinese cuisine for preserving the moisture of meat while cooking. Additionally, it provides a soft or “velvety” texture to the meat of any entree.